When clicking on "Thumbnails" in the hamburger menu, you will see a page where you can manage thumbnails, and you can see the thumbnails. The images below can be used in the calendar views, by inserting their filename in the event's description field or in one of the extra fields. An image file name can be copied to the clipboard by clicking the desired thumbnail below; subsequently, in the Event window, the image name can be inserted in one of the fields by typing CTRL-V. Under each thumbnail you will find: the file name (without the user ID prefix), the file date and between brackets the last date the thumbnail is used by the calendar. 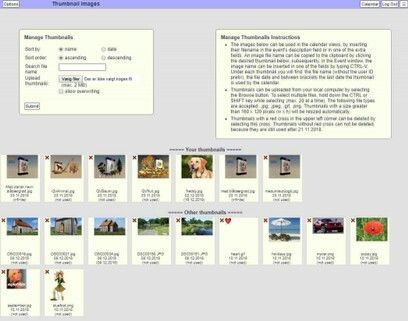 Thumbnails can be uploaded from your local computer by selecting the Browse button. To select multiple files, hold down the CTRL or SHIFT key while selecting (max. 20 at a time). The following file types are accepted: .jpg, .jpeg, .gif, .png. *(a matter of settings) Thumbnails with a size greater than 160 x 120 pixels (w x h)*(a matter of settings) will be resized automatically. What you see, depends on the settings for uploading and the setting in usergroup for the actual user.